I love a good Peter Stormare performance and we've got your chance to win a copy of one of his latest. Fulvio Sestito's Beyond the Sky stars Ryan Carnes as Chris Norton, a documentary filmmaker intent on making a movie that debunks alien abduction stories but when he meets Emily Reed, Jordan Hinson, a young woman who was abducted as a teen and returned, his determination is tested and he starts to think that maybe everyone isn't lying after all and that there's more to the alien abduction phenomenon than he first thought. The movie also starts Stormare and Dee Wallace in supporting roles. 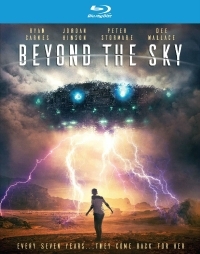 Beyond the Sky will be available on DVD and blu-ray on Tuesday, November 6. The release includes an interview with Travis Walton, abductee and author of "Fire in the Sky" as well as an interview with Navajo Artist at the International UFO Congress. We've got your chance to win one of three blu-ray's. To enter, simply email us the title of your favourite alien encounter movie. Three lucky winners will be chosen at random from all entries. Contest will close at Midnight on Thursday, November 8 and winners will be contacted via email. Contest open to US residents only.